AFAIK, In WIMBoot method PC/USB boot directly from 'install.wim', But in above tutorial USB contains both 'install.wim' and 'Windows81.vhdx' ? 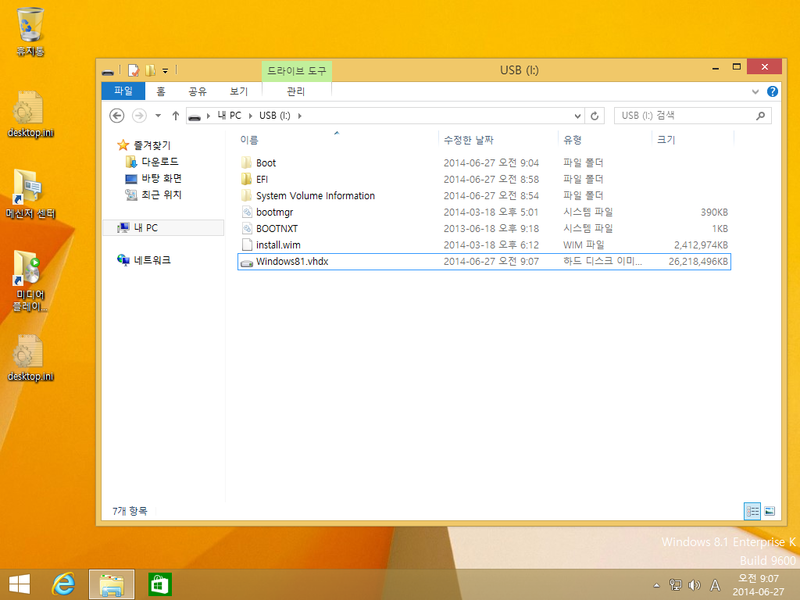 Will 'Windows81.vhdx' be deleted after creating bcdboot in the USB Drive ? OR I have to keep both 'install.wim' and 'Windows81.vhdx' in the USB Drive in order to boot from USB ? How much min space USB Drive will occupy after creating whole setup ? Can anybody please explain above tutorial in English ? Edited by devdevadev, 06 July 2014 - 11:19 AM. No, wimboot dosn't read directly from a wim file. A helper partition is required, there are pointer files from this helper partition to the wim file. This helper partition can be a vhd(x) partition too. Boot a Windows 8 with wimboot updates. Copy install.wim to the USB disk. Currently I have just finish exactly the same procedure you currently posted. It means both 'install.wim' and 'Windows8.1.vhdx' are necessary in order to boot 'WTG'. I think I will have to use 'Dynamically Expanding VHD' file so that size of the whole setup will be as minimum as possible. Am I right ? AFAIU, Total size of the WTG will vary according to size of 'Windows81.vhdx' ? i.e. Size of 'install.wim' (Fixed) + Size of 'Windows8.1.vhd' (Vary depending upon installed softwares) ? How much Disk Space (approx.) advantage 'WTG + WimBoot + VHDX' will provide over Normal 'WTG' and 'WTG + VHDX' ? Which of the following three method will save maximum Disk Space ? Which of the above method is best in term of 'Disk Space' , 'Speed' and 'Performance' ? Edited by devdevadev, 06 July 2014 - 04:12 PM. I have created 'WTG + WimBoot + VHDX' combination in my Transcend JetFlash 780 3.0 USB Drive and it is booting perfect in my 'Dell Inspiron 1545' which is only BIOS/MBR type while WIMBoot is only for UEFI-based PCs and is support only solid-state drives and eMMC (Windows HCK compliant) drives. I could not understand why 'WTG + WimBoot + VHDX' combination work in my case ? Edited by devdevadev, 06 July 2014 - 06:02 PM. Would you be surprised about the possibility that the good MS guys simply LIED in that article you posted a link to? It would not be the first time this happens, it won't probably be the last one. (legacy BIOS-compatibility mode isn't supported). may work nontheless. Use at own risk. Don't ask, if it dosn't work. Yes, wimboot works at BIOS. It's works at a rotational hard disk, is not recommended because of access time. Hence a JetFlash 780 is not supported too, slow access time. Again use at own risk. size of the whole setup will be as minimum as possible. You may trim install.wim too. A 3.3 GB amd64 install.wim drops to a 2.9 GB wimboot.wim. Which of the above method is best ? Again there is not ONE answer to this. Try all three versions. Use the version you like most. Other user may choose another one. Can I use 'WIMBoot.wim' as a Source in the 'WinNTSetup v.3.6.1' instead of 'install.wim' ? Will I have to use 'Dynamically Expanding VHD' in order to keep the size of the 'Windows81.vhdx' as minimum as possible so that there will be NO free space wastage within the 'Windows81.vhdx' ? #1 Standard MS DISM way here (requires win8.1u1 winpe). #2 CloneDisk wimgapi way here (requires win8.1u1 winpe). #3 WimLib way here (does NOT require win8.1u1 winpe). 'WTG + WimBoot + VHDX' Setup ? 1- WimLib way here (does NOT require win8.1u1 winpe). Note- WimLib way end up with a C drive occupied by only 250 MB (before 1st boot where pagefile.sys and hyberfil.sys will be created). Edited by devdevadev, 07 July 2014 - 12:57 AM. Doesn't WinNTSetup also use WimLib? In terms of occupied disk space, I would say that wimlib vs wimgapi (+wimboot) will make no difference. Indeed, a decompressed file will always take the same size. It is only when creating the WIM file that this could eventually makes a diference. Indeed, a compressed file's size may depend on the compression engine. Is it possible to directly convert 'install.esd' file into 'WIMBoot.wim' ? So that I can directly use 'WIMBoot.wim' file as a Source in 'WinNTSetup v.3.6.1' in order to create smallest 'WTG + WimBoot + VHDX powerful combination'. Does anybody know about a Script/Tool/Commands/Method in order to convert 'install.esd' file into 'WIMBoot.wim' ? Edited by devdevadev, 09 July 2014 - 02:12 PM. I am not familiar with ESD format but I believe Wimlib-imagex can handle these files. The last 2 threads mention ESD. Can we use 'intall.esd' files for 'WIMBoot' in 'wimlib' way ? 'install.esd -> WIMBoot.wim' by using 'Wimlib' ? What will be the 'Wimlib' equivalent of 'install.esd' -> WIMBoot.wim' Conversion ? And what code I should have to use in order to 'Capture Installation' and 'Apply' converted 'WIMBoot.wim' ? Edited by devdevadev, 09 July 2014 - 07:11 PM. where there is also the correspondent wimlib command . Actually I was asking for 'wimlib' command in order to directly convert 'install.esd' to 'WIMBoot.wim' (not to 'install.wim'). Can you please provide me 'wimlib' commands in order to directly convert 'install.esd' to 'WIMBoot.wim' ? what about : wimlib-imagex export install.esd 1 wimboot.wim --compress=maximum --check ? The boot flag might be missing then. Not sure the rename part (as mentionned by Wonko) is needed since wimlib should create a brand new file on exporting? hence one can choose its destination file name? Sure , I was obviously joking, the point being "what's in a name"? No, it's not about conversion to wimboot. It's about a small wimbootable file, applyedd with WinNTSetup. This creates a bigger wimboot file. Some files are expanded or less compressed, could be less cpu usage at boot. No, I don't know details. You can use the --compress and/or --chunk-size options to wimlib-imagex to choose a different compression format. The default for exporting, capturing, or appending in --wimboot mode is XPRESS compression with 4096 byte chunks. This can be changed to XPRESS with 8192, 16384, or 32768 byte chunks, or LZX with 32768 byte chunks, while still being compatible with Microsoft's WOF driver, which implements the functionality used for "WIMBoot". basically you capture an empty directory as wim maximum compression and then you export recovery compression to 2nd index, then delete the first index. Since you cannot combine the compression types, the result will be converting the recovery compression to max compression. dism /capture-image /capturedir:c:\temp /imagefile:install.wim /compress:max /name:"Bogus index"